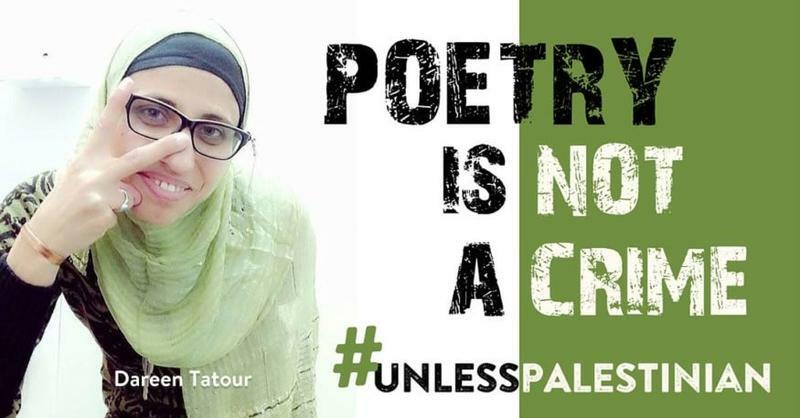 Today, the Nazareth district court sentenced Palestinian poet Dareen Tatour to five months in prison for “allegedly inciting violence and supporting terrorist organizations” through her social media posts. Previously, Dareen was arrested in 2015 and confined to house arrest for nearly three years. “Through her poetry, Dareen, a Palestinian citizen of Israel, was exercising her right to free speech and advocating against the cruel and belligerent military occupation. Yet, Israel accused the poet of incitement whilst the occupation is the worst form of incitement. Israel's unjust actions are in grave breach of Article 19 of the Universal Declaration of Human Rights which calls for the protection of the fundamental rights of freedom of opinion and expression. Once again, Israel is actively concealing the truth and punishing those who dare expose its violence and violations. The Knesset recently approved the ‘Breaking the Silence’ Law which prohibits educational organizations that oppose the Israeli army from entering schools and meeting with students. Furthermore, lawmakers are promoting the ‘Prohibition against Photographing and Documenting IDF Soldiers’ bill which prohibits the recording, photographing or documentation of Israeli soldiers.